HSBC Bank has notified campaigners that they have decided to end their business dealings with Elbit Systems, Israel’s largest arms manufacturer. 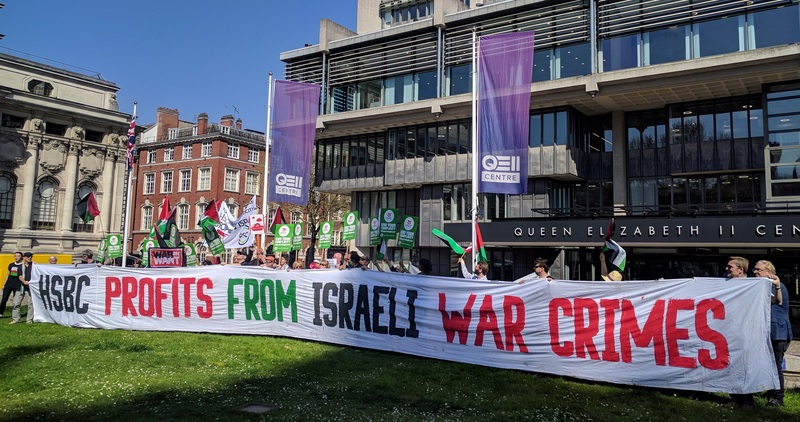 This follows 18 months of sustained campaigning by PSC branches and other local groups around the country, as part of the wider STOP ARMING ISRAEL campaign. And over 24,000 people wrote to the company, complaining about their unethical practice. 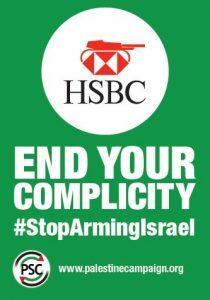 HSBC has been persuaded that their business dealings with Elbit are inconsistent with their so-called ethical banking policies. This is a major victory for the BDS movement. Brighton & Hove PSC has played a significant part in the national campaign, with monthly pickets outside the main HSBC branch in Brighton, and ‘pop-up’ pickets once a week. We know that every time we appear at the local branch they inform head office, and local HSBC customers have been horrified to discover the truth about their so-called ethical bank. And the pressure has intensified over the months, with dozens of groups around the country picketing HSBC branches. It looks like the bank has finally recognised that the contradictions between their professed ‘values’ and their actual practice cannot be sustained. 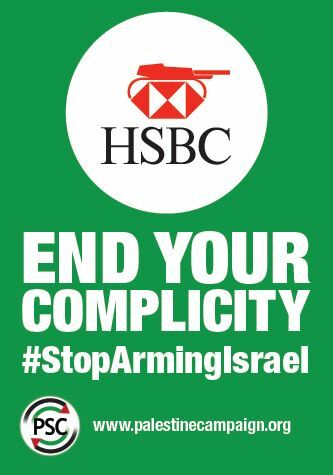 HSBC’s decision leaves intact their loans and share-dealings with UK arms manufacturers that sell to the Israeli military. These include such household names as BAe Systems, Raytheon, Caterpillar and Boeing. HSBC has refused to answer the obvious question: if their business dealings with Elbit fall short of their threshold for ethical banking, how is it ok to continue doing business with these other bad boys? The bank continues to be complicit in Israel’s war crimes and must not be let off the hook.